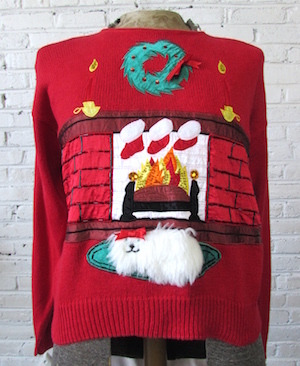 Super awesome vintage pullover ugly Christmas sweater. Red knit with a 3-D FUZZY white dog (pomeranian?) napping in front of the bead-dazzled fireplace and mantle. Under all that fuzz is a cute smiling doggy grin. Tag reads Work in Progress. Ramie/cotton. Has shoulder pads- very easy to take out if you dont want them. Condition: Good++. Missing a number of beads from the fireplace. The fuzzy material on the dog shows a bit of wear. Still an awesome Xmas sweater! Priced accordingly!